Details are emerging of what will happen to the world-famous passenger liner QE2 when it retires next month to become a floating hotel in Dubai. The plans are unlikely to appeal to QE2's traditional fans. Even the iconic silhouette of the world's best-known ship will change. According to the liner's crew, the new owners in Dubai plan to slice off the giant red funnel, placing it on the waterfront as an entrance to the ship. In its place will be a four-deck smoked glass penthouse, in the shape of the funnel but with a swimming pool. The idea is to make it the most exclusive hotel room in Dubai. The lifeboats will all go. And extra rooms will be built on the deck towards the stern. Inside, every cabin will be ripped out and replaced with new, larger bedrooms that meet the latest standards. And the ship's engines will be taken out, and the space used to create a new entertainment venue. 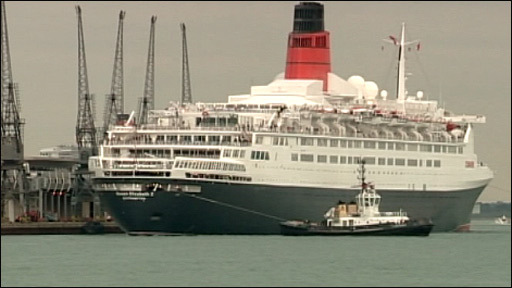 "What's happening to the ship is very good," insists Cpt Ian McNaught, QE2's master for the last five years. "Because the alternatives are so awful. It could go to scrap and disappear. Or it could get run into the ground as an ignominious ferry in some backwater somewhere." But surely many passengers would see the removal of the famous funnel as being in poor taste? "Yes, but wait until you see what's replacing the funnel," said Cpt McNaught. "It's good." The new owners of QE2 have been travelling on board for weeks, working out their plans. "They seem to change every day," said one engineering officer. "I don't like the sound of it - this won't be the QE2 we all know." But the ship is 41 years old and well past its prime. 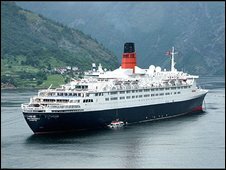 QE2 may still be the fastest cruise ship afloat, but it does not meet the expectations of today's passengers, accustomed to the comforts of newer cruise ships. To bring the vessel up to modern safety standards would cost a fortune. Environmentally, the liner is a basket case with fuel economy: 49ft (15m) to the gallon. QE2's great predecessor, Queen Mary, has been a floating hotel at Long Beach in California since 1967. It has now been a tourist attraction longer than it was at sea. On board, it retains its magnificent art deco public rooms. But financially, keeping it open has often been a struggle. QE2 was sold for £50m. The buyer, real estate developers Nakheel, will spend far more than that before re-opening the liner to guests in 2010. It wants the ship as a centrepiece of Palm Jumeirah, the palm-shaped fronds of reclaimed land and beach on the Dubai waterfront. Nakheel also announced plans this week for the world's tallest building: a skyscraper more than 1km (0.62 miles) high. The company has signed a "gagging" contract with Cunard that prevents it from talking about its plans until after the last passengers and crew have left the ship. 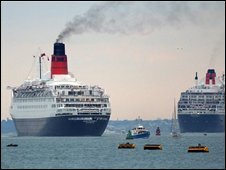 On Friday evening, QE2 sails from Southampton on its 805th and last transatlantic round crossing to New York. It will leave its home port for the final time for Dubai at 1915 GMT on Tuesday 11 November. An enormous farewell is planned.